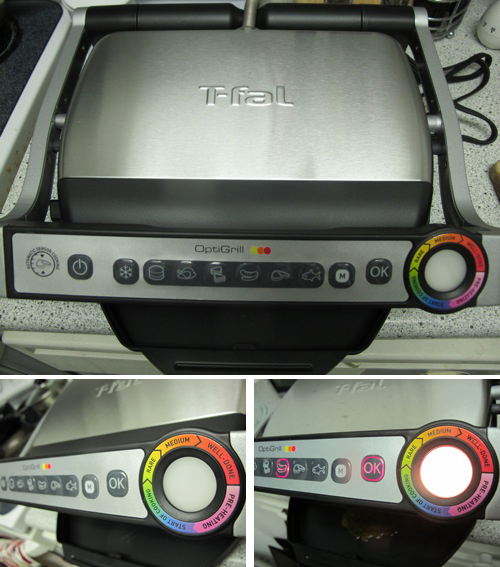 This is kind of the greatest thing to happen to my tiny NY kitchen: the T-fal OptiGrill. Not gonna lie, it looked intimidating to use when I first got it, but I found the smart grill makes cooking meat a no-brainer with its color-coded cooking indicator. The grill has an automatic sensor grilling so no matter what the thickness, it indicates by beeping when the meat is rare to well-done. When you turn it on, you just click the button showing what meat you’re cooking (they have options for beef, chicken, fish, sausage, etc.). Just close the grill to let it pre-heat, and it’ll beep when it’s ready. Then place the meat, and the sensor will change colors depending on what stage the meat is (rare, medium, medium-well, well-done, etc). But the to me one of the greatest things about this grill is you can cook frozen meat right on it since it has an option to de-frost the food, then cook it in one shot. Here, I made an easy breakfast of eggs and chicken sausages from Honest Chops (side note: they have pre-seasoned meats available there which I love because it saves me so much time). It makes it really quick to prepare meats, like these rosemary burgers I made for guests on the fly (just seasoned it with salt and pepper and added pieces of rosemary. Serve on wheat things with a little mayo spread, kale, chopped onions, and ketchup). And lastly the clean-up is super easy because of its non-stick surface. I just wipe a soapy paper towel over it and it picks the grease right up. Saves me so much time. Plus using no oils to grill gives me healthier options to make my food. MAKE SURE to leave a comment below letting me know how you entered (either on FB or with your Twitter handle). Winner will be selected and notified Thursday, September 4th. Open to US residents only. Thanks for entering and good luck!! 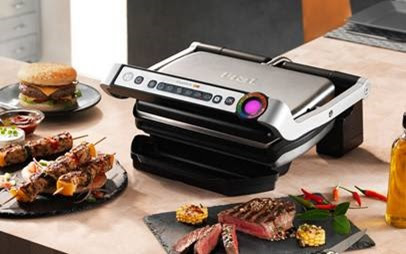 Like T-fal OptiGrill on Facebook! 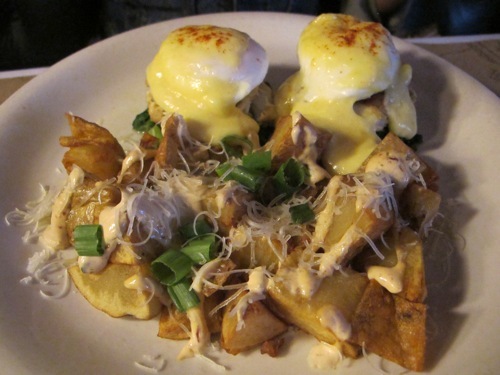 I feel like people have consistently recommended Jack’s Wife Freda to me for brunch, and today when a couple friends and I were deciding where to go for food, this place ended up coming up again in an article I found about the best brunch places in NY. Not only was the food delicious, it said, but it’s CHEAP (something not necessarily associated readily with the neighborhood it resides in). Happy to say we weren’t disappointed on any front. 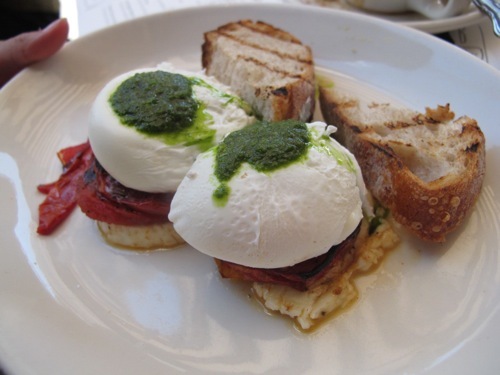 Recommended: Poached eggs with grilled tomato & haloumi (served with sourdough bread). Small, tasty, and a perfect mix of poached eggs over easy, grilled tomatoes and haloumi. Must try: Their hot sauce. 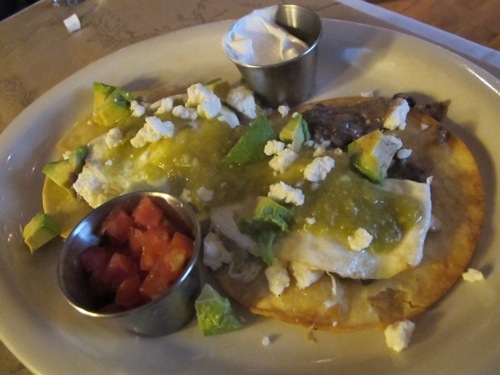 It’s not a typical sauce, made in-house with what looked like an avocado base. Just a little add so much flavor to each dish. 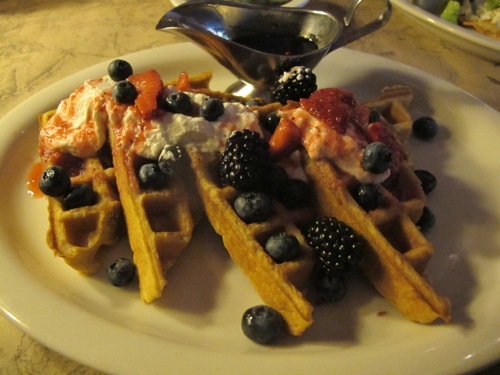 The rosewater waffle (served with lebanese yogurt, mixed berries and honey syrup) seemed like a risk, but it was light and delicious. The batter really has a light taste of rosewater and the yogurt balances it out nicely. 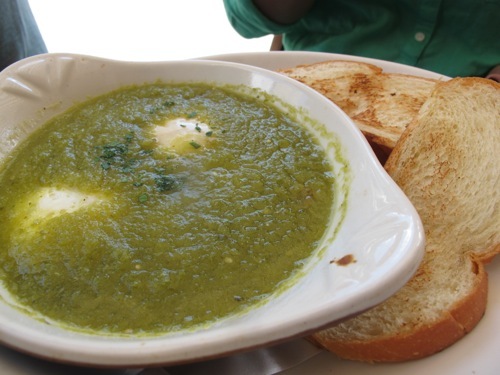 The green shakshuka (two baked eggs in green shakshuka sauce served with challah toast) is also a house favorite. Everything was excellent so you really can’t go wrong. We even asked our waiter what he recommended, and he basically starting reading the menu back to us saying he loves it all. And as promised, nothing was over $12. Not bad for such a busy little spot. Only downside is the wait time (we waited 45 minutes for a table for five, which is also pretty standard in NYC…get there early). 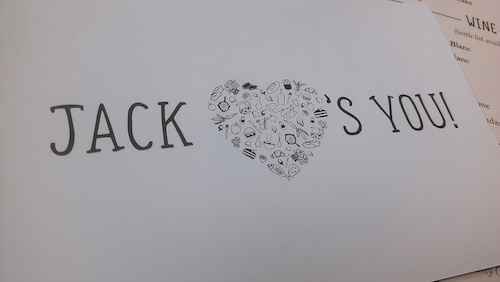 Bonus: They leave you with the cutest #jacklovesyou postcards with your check! 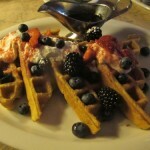 American - BATF Giveaways - Breakfast/Brunch - FOOD - "The Delicious"
Brunch at Ted’s Montana Grill + Giveaway! 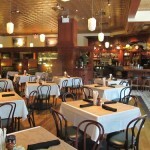 Living in midtown, I feel like I’ve exhausted some of my favored brunch places. The usual suspects for me have been Eatery and Norma’s, but all said, the area’s not known for their brunch spots as much as places like the Village. Restaurants have been trying to counteract that rep though, most recently Ted’s Montana Grill who just unveiled a new brunch menu and invited me to try it out. I didn’t even know this place existed even living a few blocks away. 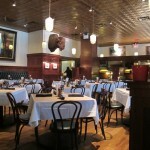 Interestingly, the restaurant was created by media entrepreneur and philanthropist Ted Turner (CNN) and George McKerrow (founder of LongHorn Steakhouse). My friend Priya came along to give the menu a try. 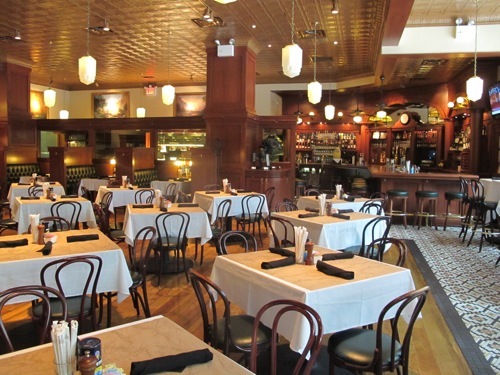 The great thing about this place is even though it’s huge, it has cozy, dimly lit booths for a more personal feel. 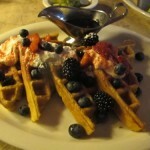 Priya and I got a sampling of their Chantilly Waffles, Crab Cakes Benedict, and day’s special, Huevos Rancheros. 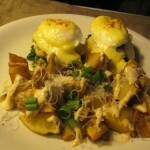 Crab Cakes Benedict: Signature St. Philip’s Island crab cakes, wilted spinach, poached eggs with chipotle hollandaise, served with breakfast potatoes. The crab cake was decidedly the favorite between Priya and I (the chipotle hollandaise gave it a slight advantage). 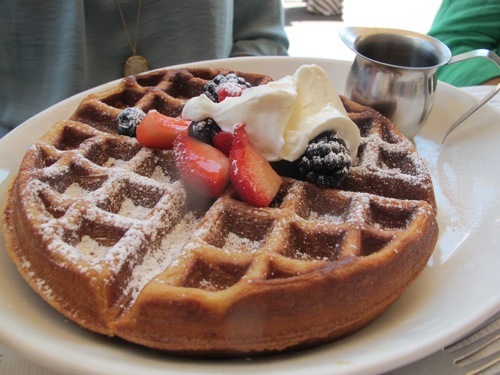 The waffle gave a welcomed sweet bite, without being overly sugary. 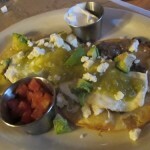 The huevos rancheros was the special of the day, which was good but could have used a little more sauce or spice. 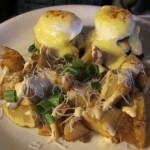 The kitchen is experimenting with their brunch menu a bit so it’ll be interesting to see what more they come up with. 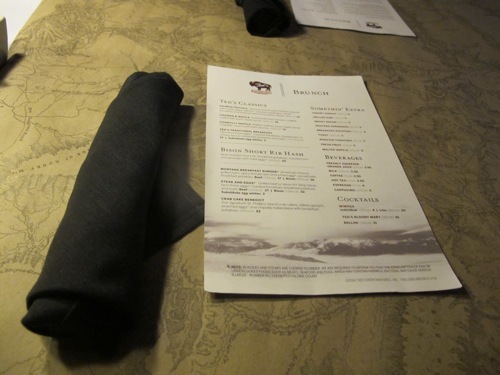 They’re off to a great start though, seeing that their incorporating more than just bison and meat to their brunch menu, even being a steakhouse that’s known for that (note: the waitress said their short ribs is one of their more popular dishes). It’s nice that the restaurant thoroughly accommodates the non-meat eaters with their brunch options. 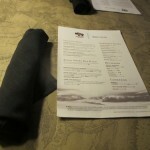 Not to mention, the service was impeccable, which made it an extra nice start to our Saturday. But don’t take my word for it — if you want to try it yourself, I’m giving away a gift card for you and a friend to try their new brunch menu or dinner! Don’t forget to leave a comment below to tell me how you entered! Winner will be contacted at the end of the week. Good luck! *Gift card value is $50. Does not include tip! Almost every nutritionist I’ve met over the years have been reiterating the benefit of including fiber in your diet. Why? Fiber helps support our digestive tract and keeps food moving through our system. The recommended daily fiber intake is 25 to 30 grams, but according to the American Dietetic Association, most Americans get only about half that amount. I’ve tried consciously including more fiber-rich foods in my meals (brussels sprouts, kale, and flaxseeds among them), and also begin my day with fiber-enriched bars. The only downside to the latter is they are a bit heavy to rely on solely for most of my fiber source. And as a food blogger, I do eat a lot at different restaurants where it’s not always easy to make sure I’m getting in the amount of fiber I should be. In steps FiberChoice, inviting me to be a part of their 30-Day Get Picky Challenge, which is pretty easy: they provide me with a 30-day supply of supplements (which helps get the recommended amount of daily fiber), and I report to you all about how it’s been working for me. 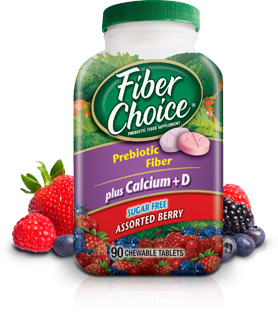 I chose to try their FiberChoice Prebiotic Fiber Chewable Tablets plus Calcium + D (for the record, it was hard to resist opting for their gummies…I’ve had them before and would eat them like candy, so to avoid that and maintain the normal recommended amount instead, I decided to go with the tablets). Also, after reading about all their products, I learned that calcium is a mineral your body needs but can’t produce so it’s obtained by foods and absorbed in your digestive tract (foods like dairy products which I try to have minimally, dark leafy green veggies, bread, soy, and tofu products are all sources of calcium). Also, I love that they use 100% of the natural fiber already found in fruits and veggies. I’ll keep you guys posted on how it’s going, if I stuck to the challenge, and if I noticed a difference. Full disclosure, the product was provided by FiberChoice and they compensated me to stick to the challenge, but I’ll share my real thoughts on what I thought and if I’ll continue with it going forward! I’ve always remained true to working with brands that have either helped me reach my nutritional goals and I was already, as I mentioned, someone who has bought their fiber-infused gummies whenever I could (fun fact: it’s one of the few supplements that don’t contain gelatin, which also aligns with my dietary restrictions, so thank you FiberChoice :)). Let’s see how this goes! I’ve already been taking them daily for a couple weeks. I’ll be posting about this a couple more times going forward, so let me know below if you have any questions about fiber, FiberChoice, etc. for now! 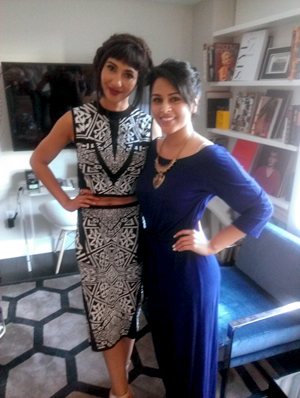 Orange is the New Black’s Jackie Cruz talks hair, lipstick, making out with a Kardashian, etc. Jackie Cruz has every reason to be full of herself. Let’s just put that out there. The Domincan-American beauty, who plays the goth and often unaware Flaca Gonzalez on Netflix’s #1 series Orange Is the New Black, is a talented actress, (real-life) singer and songwriter who you would I expected to be sitting in a VIP corner when she recently hosted Überliss‘ braid bar at the Paramount Hotel in NYC. What I found instead was a disarmingly funny and down-to-earth interview that felt a lot more like talking to a bestie I was trading makeup and boy secrets with the first ten minutes (true story, although the latter is off-the-record). She was down to dish all with no pretense. Read on for her favorite new hair brand she recently partnered with, beauty secrets from her grandma (apparently vapor rub is the new Windex solution for everything), and yes, her infamous kiss with a certain Kardashian. Beauty and the Feast: Tell me a little about why you decided to partner with Überliss. Jackie Cruz: I have crazy curly hair that I’m always using straightening treatments on, so that’s really how it started. Überliss has a lot of products that’s really helping with my dry hair. Their Rituoil is my favorite. My hair gets really frizzy in the summertimes so this keeps it nice and smooth. BATF: What are your must-have beauty products? Cruz: I’ve perfected the cat eye with Chantecaille’s eyeliner. I love it, it’s perfect. 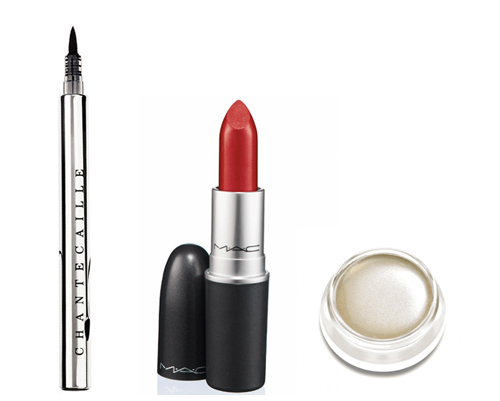 M.A.C.’s Ruby Woo lipstick is a must. I really can’t live without a luminizer. I love the one by RMS. When I wear it, I’m just glowing. I use it everyday, not just on the red carpet. BATF: Do you have any beauty secrets that were passed on to you from your mom? Cruz: I’m Dominican and we have curly coarse hair. I’m big on avocado treatments and egg whites to keep my hair shiny. You just apply it and shampoo wash it off and it makes your hair really glossy. My grandma puts vapor rub on everything. Dominicans mix it with baby oil and apply it on a zit. I also have a problem with bags under my eyes, so I just put a cold spoon on freezer and place it under my eyes for a few minutes to minimize them. BATF: What’s one of your favorite story lines from OITNB? Cruz: I love Lorna. In the first season, she was sweet but you don’t know why she’s in prison or her obsession with Christopher. [Yael Stone] is such a great actress and amazing person. We read lines to each other. She’s a great person to work with and a great friend. Just very talented. BATF: How did you prepare for your role as Flaca? Cruz: I have a friend who’s Flaca. She’s the real life Flaca from back in the day. We used to waitress together. I told her, you’re going to own a Black Card one day. She’s like, ‘Aww that’s the nicest thing anyone’s ever told me!’ That’s Flaca right there. She used to do crazy things and I told her one day I’m going to play you on TV. For two years I’ve been imitating her. So thanks to her, I’m Flaca. I don’t mention her name, because she wouldn’t want me to. But only me and her need to know about that. She’s always representing that, she posts my things and supports me unconditionally. 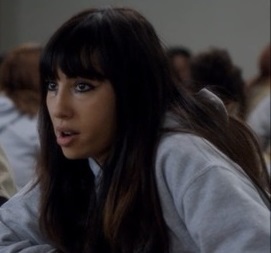 Now she’s in college and a motivational speaker – Flaca! She’s Flaca’s future. 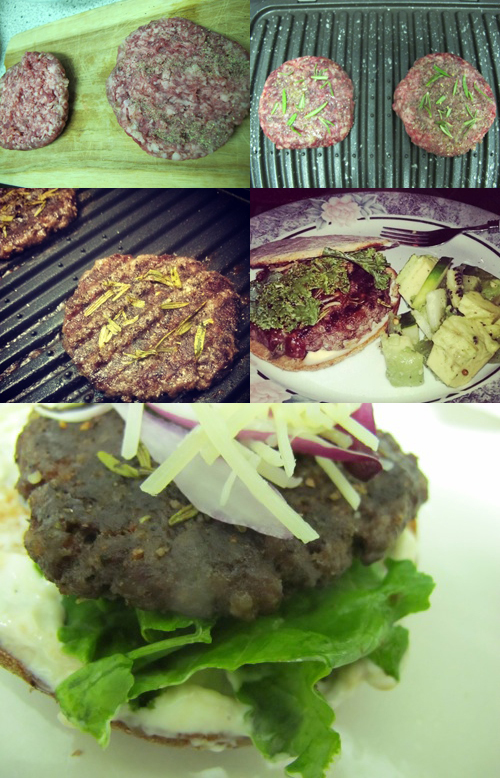 BATF: Let’s talk about the other half of my blog — food! Do you cook at all? What are your favorite things to make? Cruz: I was also raised Italian. My Italian family taught me how to cook. I can make a mean lasagna and spicy meatballs. I can’t cook Dominican food sadly– I like to go to my aunts house in the DR and have the real thing. I was so spoiled. Cruz: My home. It can be anywhere. I’m a gypsy. That’s why my album’s called Hollywood Gypsy. Cruz: He not alive though — does that matter? Elvis Presley. BATF: Last question. I looked up your character on a site, and all it said in your bio was, “once kissed Kourtney Kardashian.” Any comment? Cruz: Wow, you must be one in a million! I used to practice. It’s just something you do randomly in the moment. I’m focused on my career now. Now I have a name for myself, people bring that up but I say let it go. Thanks to Jackie Cruz and Uberliss for a fun interview!